Capitalization comes down to calculating the value of capital after a number of periods since the start of the operation. Refresh returns to calculate the value of a capital since its value today in the future. We will address the financial calculations allowing to focus on key finance issues. 1.2 Fixed rate or variable rate? 1.4 How to change an interest rate? Before you begin this first theme, it is necessary to study some knowledge referring to the interest rate used. In order to define a rate used during a financial transaction, we use the term annual rate. The latter can be calculated in proportion to the corresponding rate if the calculation time is less than a year. Proportional attention does not mean equivalent, having annual 6% or 0.05% monthly is not the same, because having 0.05 monthly allows you to reinvest and ultimately to have a little more than 6% annual. Variable rate: a rate which may be revised at certain deadlines by a clearly determined the market rate. Fixed rate: it is a rate that will not change until the end of the financial operation. When a calculation, the rate used is the nominal rate. But the gain is calculated if there are investment does not match the actual gain. For what reason? Inflation coming to nibble a part of the amount invested. -This allows amounts expressed in current euros amounts expressed in constant euros. Current prices are the prices as they are shown in a given period of time, they are considered in par value. Constant prices real prices i.e. corrected the variation of prices relative to a given base or reference. Used in the same way the terms constant euros and current euros. If we take in current euros we print the prices of goods explodes within a few years. Note: the actual rate is often lower than the nominal rate. Calculate the interest rates real of a 3% investment given that the inflation rate is 2%. But even once it is a simplification! If the nominal rate is higher than the rate of inflation, then there is a real gain. How to change an interest rate? Specialists noted that interest rates are likely to be subject of sometimes heavy fluctuating on a short time. If many variables may explain these fluctuations, the main causes may be among other things the level of economic growth, proportional to the risk of inflation or unexpected policy conducted by the banks. Nevertheless, despite all these possible setbacks, it is possible to see that long-term investments have very often higher than the investment interest short-term. Still, it should be noted that, generally, the rate will vary according to the duration of the operation affiliated and that these same rates at the same time can be different depending on the country. If we calculate only the interest earned on the capital, so the calculation is simply at once and in proportion to the duration of the operation or the placement. This type of interest is called simple interest. If we calculate the total of the interest earned on the capital as on interest, so the calculation is done in a way that the interests are added to the capital at each maturity. This type of interest is called compound interest. Simple interest is calculated for operations whose duration less than or about equal to a year. For operations whose duration is longer than one year, we calculate compound interest. Even in the absence of inflation, an investment must be paid. Place a sum presupposes a waiver for immediate consumption on the other hand, a greater future consumption (definition in Economics). Capitalize is to answer the question how much I'll have if I place X euros at the rate y in n years? Human was being programmed by evolution to give more interest to the present than to the future (eat meat now lets not get a steal and so to die, so those who consume now were more likely to survive). So he gives up eat now, going to that so it's more after. There are also paid the investment risk. Generally, the scale used for the capitalization is the year but this scale can vary by case. 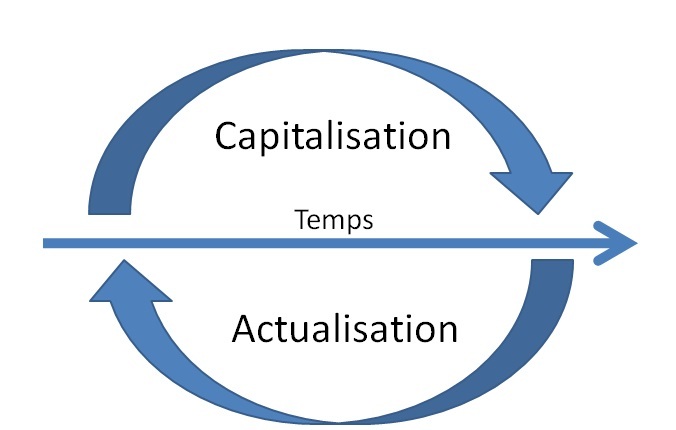 The principle of capitalisation is such that the interest earned over a given period will be added to the capital at the end of this period in order to calculate interests that will be achieved during the next period. in simple terms if you're on a games with boxes, whenever we advance you win 10%, we start with 1000, we advance a we win 10% over 1000, we're still moving a win 10% over 1100, one more and it's 10% of 1210… We don't do that accumulate. During such a principle, can speak of capitalized interest and one is able to say that the interests will be compound interest. Note: Earned value is always more so than it is of high interest and long lasting, it's all the power of compound interest. The legend is located 3,000 years BC. J.C.
King Belkib (India) promised a fabulous reward to which he would propose a distraction that would satisfy him. When the Sissa, son of the Dahir Brahmin sage, presented him with the game of chess, the sovereign, Sissa asked what it wanted in return for this extraordinary gift. Sissa asked the prince to make a grain of rice on the first square, two on the second, four in the third, and so forth to fill the Exchequer by doubling the amount of grain on each box. The prince immediately granted this award without suspecting what was to follow. More than 9 billion billion grains! Global rice production is estimated by the FAO to 699 million tonnes in 2010. The average weight of a grain of rice is difficult to estimate but it would turn around 0.04 g.
Therefore, more than 1,000 years of world production of rice in 2010 (knowing that it is far more important than at the time) to reach this staggering amount! • a = amount paid at the end of each period. Beware this is the formula of the SUMS of the geometric sequence differently than before or it was to know the amount n of a suite. Attention as there are payment at year end, there are 11 period and not 12 as pour 50000 late 12 th, but it n ' is not accruing interest. Discounting is calculating the value to our day a sum or multiple future sums. Discounting is calculating the value to our day a sum or multiple future sums while the CAP allows to know what will be in the future a sum of our days. Know what is currently worth a euro in the future. Indeed, discounting allows to predict the value of a euro in the future, regardless of the period although this period is often of a year. Find out what will be equal amounts expected in the future. To compare projects that give several irregular payments. When considering an investment project, it is necessary to predict the annual results expected over several years. Then meet in the presence of a suite of money to bring back to one, to compare either the amount invested, the expected amount of other investment projects. These are, related to different dates, will be updated to the same date (in general, if we start to today's date, the date 0). To support the applications of laws. Today, accounting standards require that the end of each fiscal year of a business is subject to a discount in order to evaluate certain positions of the company. The CCP tells us that, at the end of each fiscal year, the company undertake a refresh to evaluate certain positions of the balance sheet. When there is an impairment of assets property, its 'real' (or current) value must be determined in order to measure the suffered depreciation. We're holding the higher of the following two values:-market value: amount obtainable from the sale of assets;-use value: amount updated of future economic benefits expected from the good. Discount calculations are essential in finance. We'll eventually find them on several occasions. Get a rate of return. A rate of return to income we hope to get to a project. A project is a series of income. Judge the project and determine whether it is satisfactory compared to the cost of money (credit or dividends to be paid) often requires to calculate the expected rate of return on the basis of projected revenues compared to a reference (such as the cost of money) rate or the rate of return offered by other investments. The current value of a capital will tend to be reduced depending on the rate and duration of discounting, it's normal because we're in the opposite direction of compound interest. In order to simplify the thing, it is important that the refresh comes back to do the inverse calculation of capitalization or remove interests to the sum that interests us. This amounts to calculate the value of a capital that will be received in a number of periods of our days taking to party that the capital is to compound interest. Either a capital of € 2,000 to perceive in 2 years. What is the value of this capital today (at the time 0), if we use a discount rate of 5%? It is equivalent to have now 1814 or 2000 euros in two years. K (for by examples 0 periods) is equal to K factor of 1 + t the whole period to the negative exponent. A constant sum is paid at the end of each period (if it is years, the first sum is paid at the end of the first year). We can say that the amount of the loan is equal to the value of annuities, updated at the rate of the loan. Consider a loan of €100,000 at the rate of 5% refundable by constant instalments of end of period 6 years. Calculate the value of the debt in 4 years before the deadline (the end of the second year). The company will pay €19 701,74 to the Bank at the end of every year for 6 years. At the end of the second year, the value of the debt is 861,39 €69 (amount to be paid if the company decided to repay on that date). It may happen that the flow of a title are so long that the title is ours: in which case the end of period dividend is said constant. It is then a pension, it's really very interesting financially speaking, especially if the annuity follows inflation. example I buy an action that gives €10 indefinitely, the rate is 5%, what is the value of this action? There may be times that you have all the knowledge of the operation except one: the rate of this operation. If this is the case, just to vary the unknown factor of the previous theme. The actuarial t of an investment rate of return is the gain obtained during the term of this investment expressed in the form of an annual rate. This stranger is the rate of return the concerned investment actuarial. For this rate, there is equivalence between the sum placed (or invested) and the present value of the payments received in return. Clearly, it is the total of the gains made during the placement will be given in the form of a rate. Example: You pay 10,000 euro and we promise 11000 in 3 years, what is the rate? Where the rate of return is previously imposed, then the only likely to vary point is the basic amount. If you do a refresh of the amounts that are expected, we can find the amount necessary to place. either the amount of the fixed cash payments to derive a rate of return. Two rates are to be proportionate, must be equal to the ratio of the corresponding periods the relationship between them. Banks use rates that are proportional to annual rates or rates for a given period when payments are made before the end of this period. This amounts therefore to do use an equivalent annual rate which will be stronger than it officially announced.